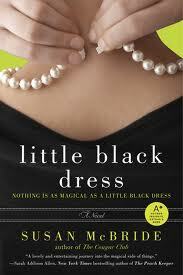 Little Black Dress was a great little book with a mysterious little black dress! This story about family secrets captured my attention and I loved the slow reveal over the course of the novel. I thought the alternating narrative suited this story and kept me intrigued as it passed back and forth from mother to daughter while unravelling their family secrets. There were aspects that I found predictable, which was unfortunate, and took away from the novel somewhat for me (I’d read something similar recently). In the end though, I still enjoyed watching Toni uncover the truth about her family and all the characters coming to terms with their past and look forward to their futures. And speaking of the future, how about that little black dress? Would you want a glimpse of the future if the opportunity presented itself or would you prefer not to know? This mystical dress sends each woman down different paths in their lives, bringing them together at various points and veering away from each other at others. I still have no idea what I would do, but suspect I would follow along Evie’s line and keep it hidden, digging it out as a last resort. I enjoyed all the characters, thought they were well developed and even though I didn’t necessarily agree with all their choices, they were always explained and based on their characters they seemed plausible. I enjoyed Evie’s story just as much as her contemporary daughter and became immersed in the description of her era from the courtship with her husband to the family dynamics and history of the vineyard. The ending surprised me, but it was a pleasant surprise and I won’t divulge much other than to say it was probably the only real unexpected part of the novel for me and it didn’t seem out of place or unnatural to the story. I quite liked it actually. Be sure to pick up Little Black Dress if you’re looking for a great family saga spanning generations with a bit of a mystical edge. I look forward to more from Susan McBride!